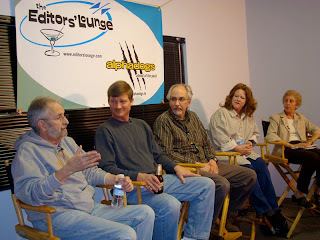 The discussion panel included 2-time Oscar™ nominated film editor, Billy Weber, seasoned finishing editor and colorist, Terence Curren, veteran reality-television editor, Glenn Morgan, and Emmy™ nominated trailer editor, Carol Streit. The discussion was deftly moderated by Debra Kaufman of StudioDaily.com. If you were unable to attend the event, you can watch the Editors' Discussion Panel: Careers any time online. Check out other event videos on the Editors Lounge Vimeo Channel.